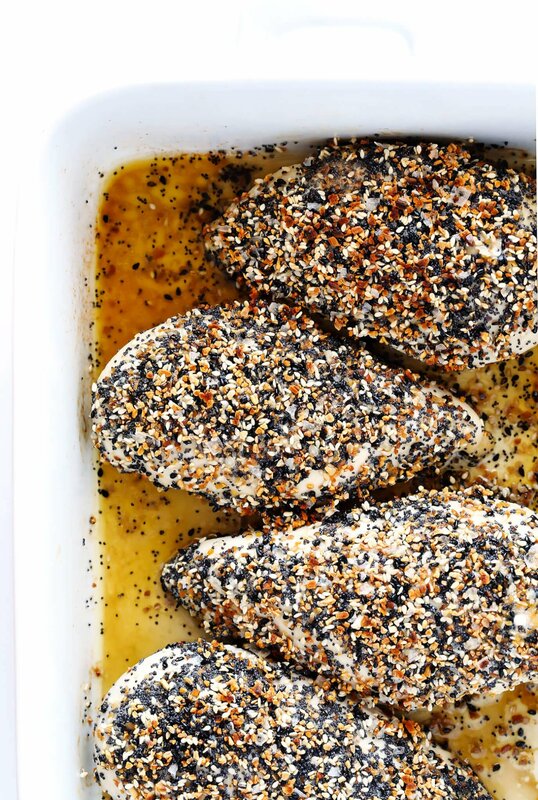 Kick your baked chicken up a major notch with some delicious everything bagel seasoning! So simple and SO flavorful. That’s right. As many of you saw on Instagram stories last week, I randomly decided to try sprinkling a leftover chicken breast with some everything bagel seasoning for dinner one evening. And just like that…a new favorite of mine was born. And just like that…my Instagram messages inbox blew up. Ha, apparently you all love the idea of “everything” chicken as much as I do! To make the chicken, first let the chicken breasts brine in saltwater for at least 15 minutes. (Unless your chicken breasts were sold pre-brined — just check the packaging.) See details for brining in the recipe below. Once the chicken is ready to go, give it a quick cold water rinse and then pat it dry with paper towels. Then brush the chicken breasts on both sides with melted butter. Add them to a baking dish or baking sheet. And sprinkle generously with the seasoning blend. (I thought the chicken was plenty flavorful with just seasoning on top of the chicken. But if you’d like to go big, feel free to fill a plate or bowl full of seasoning, and then dip the chicken in the seasoning so that it’s covered on all sides.) Give the chicken a gentle pat to press down the seasoning, and then mist it briefly with cooking spray. Then bake for about 20 minutes, or until a cooking thermometer (this $15 cooking thermometer from Amazon is my fave) reads an internal temperature of 165°F. Remove the pan and place a loose tent of aluminum foil over the chicken to let it rest for at least 5-10 minutes. As I mentioned, this chicken would literally pair well with just about any sweet or savory side dishes. 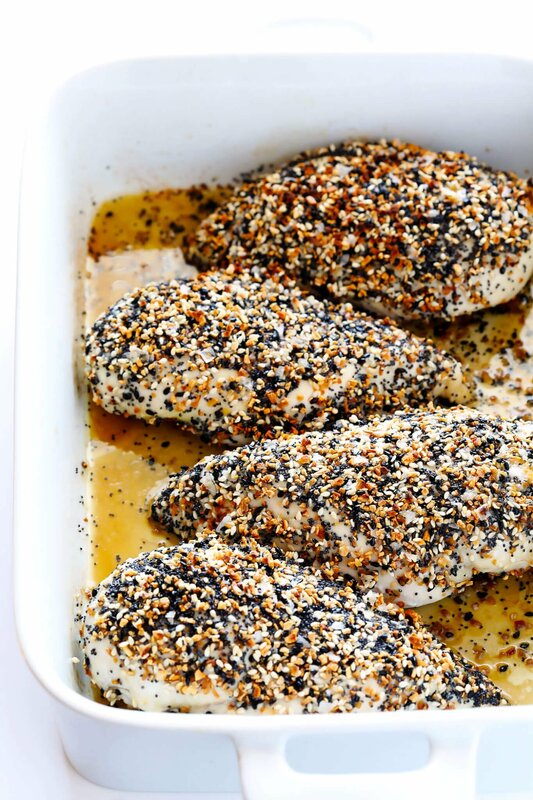 And if you don’t happen to have chicken breasts on hand, you could also use the seasoning to make baked chicken thighs or legs (or make chicken strips or nuggets). The options are pretty limitless! The one thing you’ve just gotta do is try it. 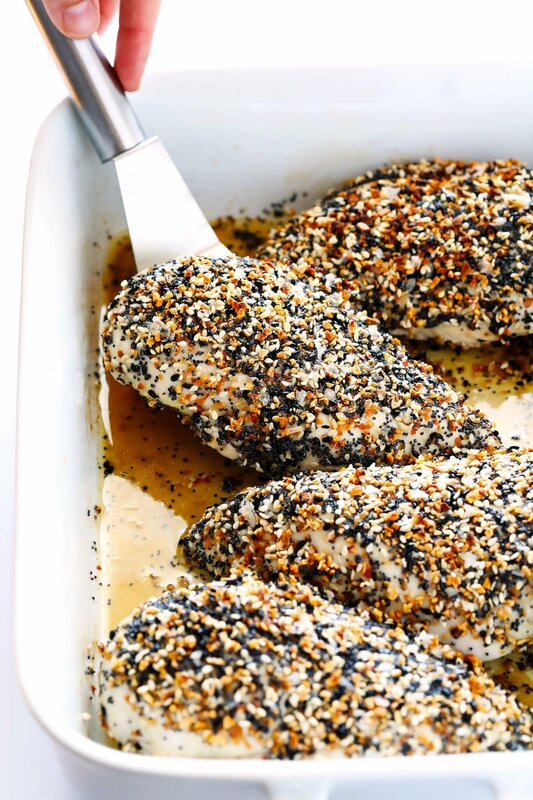 This “Everything” Chicken recipe is made with classic everything bagel seasoning, and baked in the oven to juicy, tender, delicious perfection. 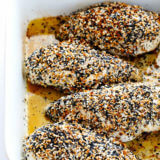 Sprinkle approximately 1 tablespoon of the seasoning blend evenly on top of each chicken breast. Gently pat the chicken to press on the seasoning, then mist the chicken with a brief shot of cooking spray. Once the chicken is cooked, remove the pan from the oven and loosely tent the pan with aluminum foil. Let the chicken rest for at least 5-10 minutes. Then serve immediately. Love! I totally have the Trader Joe’s seasoning, it’s the best. It would be fun to stuff the chicken with cream cheese or goat cheese to get the “everything bagel” experience! What an awesome idea! I have extra Boursin cheese I need to use up! Thanks!! You’re a genius! I am going to have to try it with and without cream cheese! Yes, we love that idea! This is the one recipe that got me hooked on your blog! Even before Trader Joe’s created the everything seasoning and I had to combine them all myself. I love your stuffed cream cheese version best. I sometimes stuff mine with garlic & herb laughing cow cheese and I pour Olive Garden dressing or Italian dressing around the chicken. It adds flavor and keeps chicken juicy. This recipe is my go to recipe. Your blog inspired me to start my own healthy cooking blog of my own. You are such an inspiration! We purchased the Trader Joe’s Everything Bagel Seasoning the second it hit the shelves and have been using it on every and anything. Big fans of the everything bagels for years so to have this flavor on so many things is AWESOME!! I’m going to try your recipe also as like to try new Seasoning!! For sure will make this chicken and think like the previous lady I’ll stuff with cream cheese and spinach or roasted red peppers and then roll in the seasoning and bake. Yum. Thanks & Love all your tips and recipes. I’m fortunate enough to have TJ’s here in Arizona and have been using and loving their ‘Everything’ seasoning since it first hit their shelf. I have tried it on just about EVERYTHING! Thanks for the recipe for the copycat version. I will try it soon. What a great idea! I love “Everything Bagels” – Can’t wait to try this – thanks for sharing! This Trader Joe’s seasoning seems to be pretty good. I would try it out. Love this for so many reasons but mainly because the texture of baked chicken is never my favorite (no browning) the crust on this totally makes up for that! OMG, I love that seasoning, I’ve been putting in on hard boiled eggs but clearly, I’ve been underusing it! This looks simply delicious! Trying it out next week! Thanks, Kristen, we hope you love it! Espero que você aproveite a receita! great thinking! had not seen this one coming or even anything like it before but know the flavors from eating everything bagels, which was I think your inspiration for this? Thank you for testing this one, I’m pretty tired of my chicken breast recipes, even the good ones! Such a simple idea but packed in flavor. I’m going to try this tonight! I made “Everything” tuna steaks the other night-I like mine a little rare and served with Unagi Sauce. YUMMO! Yum! 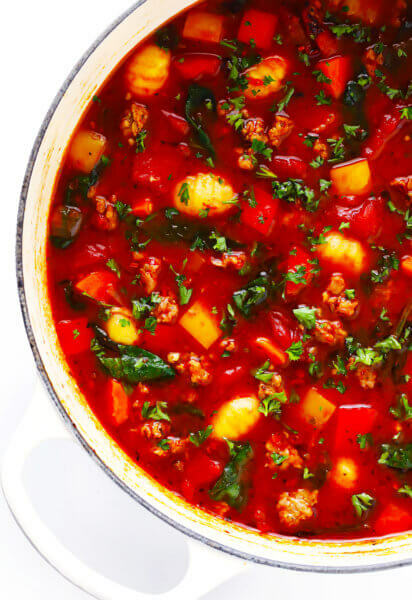 This is the first recipe I’ve tried from your site, and my boyfriend and I loved it. 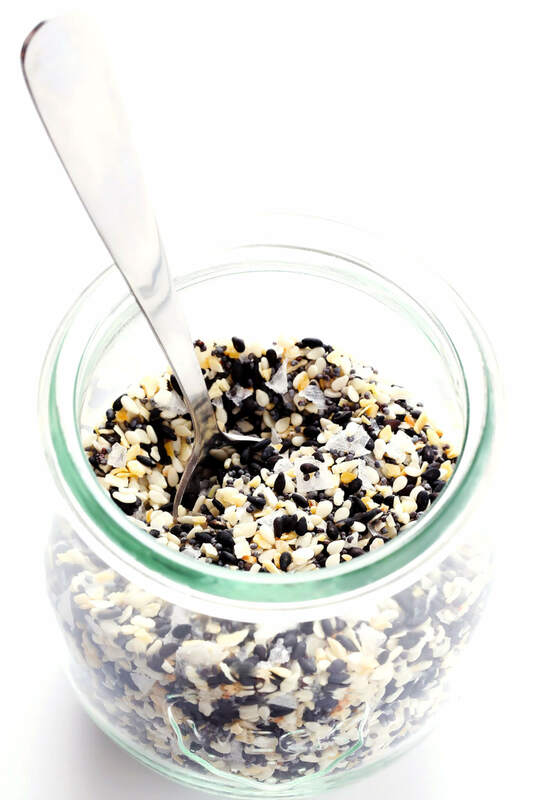 So delicious – thank you for this fun suggestion for our “Everything But The Bagel” seasoning! Great seasoning love everything bagels thought it was a little to salty for my taste but will try other options to cut down salt flavor. Nice change for chicken will try to stuff with flavored cheese ! I have mad eyes this about three times now and we love it! 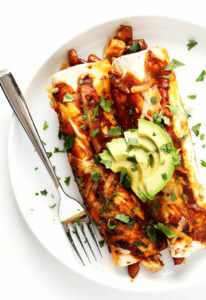 another great recipe idea, great thinking, and yes, already have the TJ’s everything stuff, thank you! This turned out so well. I love the 5 step foolproof technique. I substituted chicken tenders because my kids like those better and baked for 15 minutes and probably could have cut off a minute or two because they were well over 165. I was worried that they would be dry but magically they weren’t. That was the most tender juicy delicious chicken I’ve had in ages. Thank you! This is a keeper. 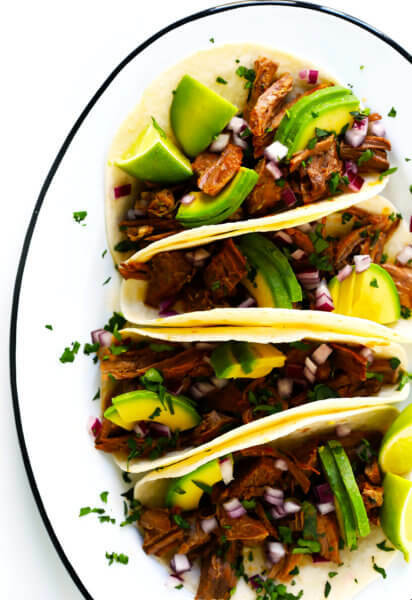 So flavorful and EASY!! OMG… was skeptical at first, but this is delicious, people!!! Try it! I’ve been a longtime fan of Trader Joe’s Everything but the Bagel seasoning and man oh man does it go well on baked chicken. I doused the chicken in melted butter and coated each breast in bagel seasoning, then served with spinach and wild rice! 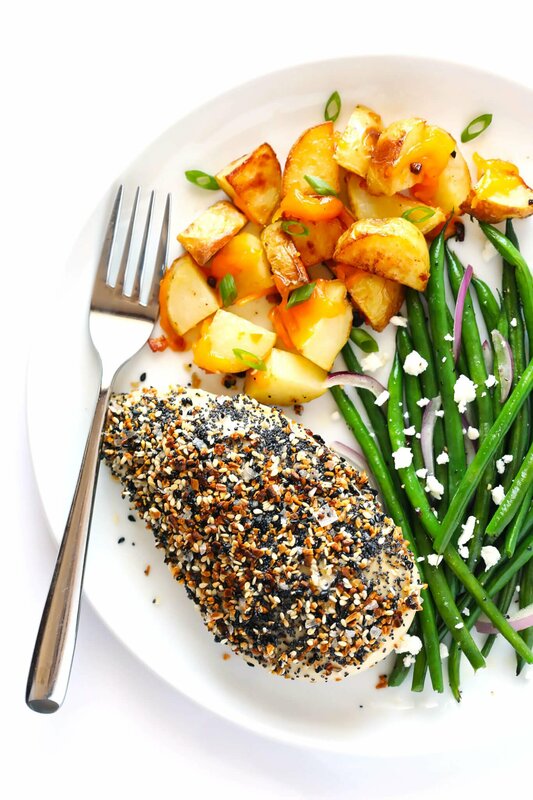 Delicious and satisfying weeknight meal! Loved pairing this with the Green Goddess Soup! Absolutely delicious, satisfying and nutritious. Your recipes are ALWAYS a hit with my family. Thank you! Made this last night. Was good although I found it salty.Since the bagel seasoning already contains salt, can I reduce the amount of salt when I brine the chicken? By how much? Thanks! 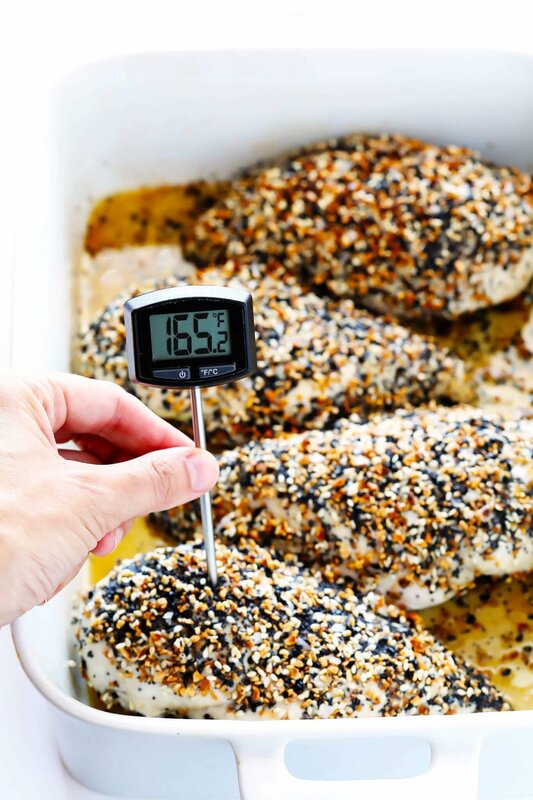 Looks like a great recipe, but 165 is WAY too high of a temperature for chicken. If you want your chicken to be juicy and tender, you should aim for 150.